As part of their continuing mission to encourage more people to discover the joy of traveling by bicycle, the Adventure Cycling Association has designated this Saturday, September 29, 2018 as the third annual Bike Your Park Day. Even though our Night Ride is free and no pre-registration is required, if you register online, you'll be entered in Adventure Cycling's Sweepstakes to win a Co-Motion Divide touring bike or a trip for two on Amtrak to Glacier National Park! Click here to register for our Night Ride and enter the sweepstakes. Rent One, Get One Free! If you don't have a bike, we're going to make it easier for you to enjoy Bike Your Park Day! 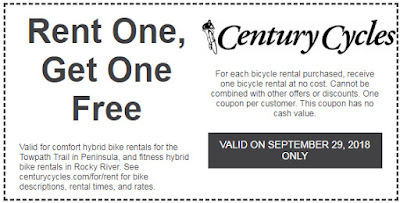 Saturday, September 29, 2018 will be RENT ONE, GET ONE FREE DAY for our Towpath Trail Bike Rentals in Peninsula and our Fitness Bike Rentals in Rocky River! Just bring this coupon! NOTE: Bicycle rentals are NOT available for the Night Ride on the Towpath Trail.